March corn fell to strong chart-based support at $3.71 before recovering slightly into the close. Managed funds ahead of last Fridays’ report were estimated to be net long 75,000 contracts. Fund length peaked in mid-Dec and has since been pared down. The February WASDE lacked much insight into world grain price direction. Fob basis in Argentina has fallen $.20/Bu this month as the harvest looms and production estimates are record large. 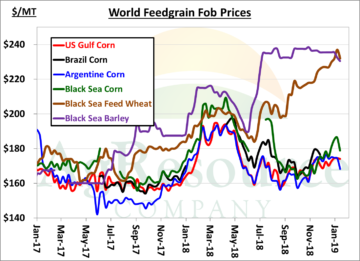 Argentine corn exports won’t begin in bulk until June, but the market is positioning itself to boost its share of world trade – particularly relative to last year. The US’s stranglehold on corn exports will be loosened beyond spring. World barley prices are also a bit weaker this evening. However, $3.70, spot, is expected to hold. Bitterly cold temps and tight/ expensive hay supplies will sustain solid feed disappearance through the balance of winter. Much improved rain lies ahead in Central Brazil, but soil moisture is very short in Parana & Mato Grosso do Sul. A lasting period of normal rain is needed. Range bound corn trade continues. We maintain a strategy of buying breaks and being patient in extending cash sales & hedges awaiting a trade deal with China.